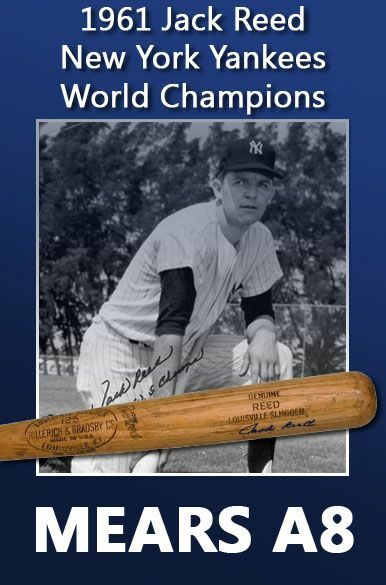 Jack Reed was one of the first Yankee outfielders to become “Mickey Mantle’s spare legs.” These were guys who would replace the oft injured, always-in-pain superstar in the late innings of games after The Mick would get his last at-bat. Often times, when Mantle made that final plate appearance, thousands of Yankee Stadium fans would head for the exits so usually, when Reed was coming into a game he’d see huge crowds of people leaving the stands. As a result of his very specialized role, Reed was one of the select group of position players in Major League history to accumulate more games played than plate appearances during their careers. This Silver City, Mississippi native got into 222 games during his three season career in pinstripes that began in 1961, but came to the plate with a bat in his hand just 144 times. He hit just one home run during that span and I remember it very well. It happened during a Sunday afternoon game against Detroit at old Briggs Stadium in July of 1962. As usual, Reed was on the bench when the game started. At the end of nine innings, the score was tied 7-7. It stayed that way for the next 12 innings. Reed had entered the game in the top of the thirteenth, to pinch hit for Phil Linz and was then inserted in right field. He was hitless in his first three at bats when he came to the plate in the top of the 22nd inning with one out and Roger Maris, representing the go-ahead run on first base. Reed hit a Phil Regan pitch into the stands for a two-run home run to knock in the winning runs of what was then, the longest game in Major League history. I think I can remember watching that entire game at my Grandmother’s house. It lasted for eight hours. It was during this same game that a Yankee rookie pitcher named Jim Bouton began his reputation as a “bulldog” on the mound by pitching seven and a half innings of shutout ball to earn the victory. Reed was born on this date in 1933 and still lives in Mississippi. In addition to being a pretty good baseball player at Ol’ Miss, Reed had also been a real good collegiate football player. This second Yankee utility outfielder, also born on this date, was also good at baseball and football during his college days. He eventually made it into the Hall of Fame. Not the one in Cooperstown, the one in Canton. 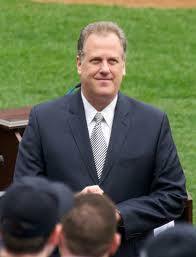 He also shares his birthday with this former Yankee war-time catcher and this current Yankee play-by-play announcer. His name was Nathaniel Michael Garbark but everybody called him “Mike.” Growing up in Texas, he was a great all-around athlete and after completing an outstanding football career at Villanova University, he followed his older brother Bob into a career in professional baseball. When he signed with the Yankees in 1938, New York hoped he might some day replace the great Bill Dickey. But Garbark’s weakness was his hitting. He struggled at the plate for the next six years, at every level of the Yankee farm system. By 1944, however, Garbark and 37-year-old Rollie Hemsley were the two best catchers left in the Yankee organization who had not yet been drafted. 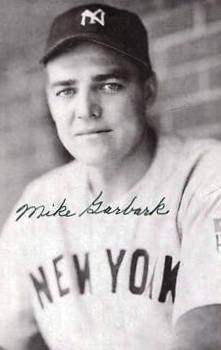 Yankee Manager Joe McCarthy, promoted Garbark to the big league roster that year and as the 1944 season started, he served as Hemsley’s backup. Then in mid-August of that year, Hemsley was drafted and the 28-year-old Garbark became the starter. He caught 29 straight games and earned the admiration of his Manager, teammates and the Big Apple sports media by doing a decent job behind the plate and surprising everyone by hitting a solid .261 in 89 games of action. That performance earned him a second season as the Yankee starting catcher and that’s when his offensive problems returned. He was hitting .038 at the end of April. Incredibly, he went hitless in May and lowered his average to .020. At one point, Garbark went on an 0-49 streak at the plate. After one fruitless at bat, the frustrated Garbark returned to the Yankee dugout and did his Paul O’Neill interpretation by smashing the water cooler, destroying the bat rack and kicking the bench. McCarthy actually had to physically sit him down, rub the guy’s shoulders and tell him not to worry about his hitting because he was going to keep catching for the team, no matter what. That assurance probably helped because Garbarak did start hitting a bit and by the end of August, he had his average back up to .218. But the Yankees had also brought in new catchers like Aaron Robinson and Bill Drescher. By the end of the 1945 season, the war was over and so was Garbark’s big league career. He went on to become a Manager in the minor leagues. So why wasn’t Garbark drafted also? He was declared 4-F by his draft board but I couldn’t locate the reason cited for that classification. He passed away in 1990, at the age of 80. Garbark shares his February 2nd birthday with this outfielder who was known as “Mickey Mantle’s legs”, this one-time Yankee outfielder nicknamed Papa Bear and this current Yankee play-by-play announcer. George Steinbrenner loved football and loved the toughness of football players, which is why he spent lots of Yankee dollars trying to get gridiron guys like Deion Sanders, John Elway and Drew Henson to play for New York. Long before “The Boss” began his quest to put pigskin toughness in pinstripes, another well known “George” tried the same thing but in a far more personal and direct manner. Before he became an NFL Hall of Fame legend as a player, coach and owner of the Chicago Bears, George Papa Bear Halas was invited to attend the Yankee’s 1919 spring training tryouts and audition for a spot in New York’s outfield. He did well enough to make that year’s opening day Yankee roster and actually started some games in right field at the beginning of the Yankee season. Unfortunately, Halas had hurt his hip in spring training sliding into third on a triple he hit off of Brooklyn’s Hall-of-Fame hurler, Rube Marquard. Papa Bear forever blamed that injury as the reason why he went 2-22 during his 12-game regular season career in pinstripes and ended the 1919 season and professional baseball career on the roster of New York’s American Association affiliate at the time, the St. Paul Saints. So for those of you that thought A-Rod experienced the most significant spring-training hip injury in the history of the Yankee franchise during the 2009 preseason, I beg to differ. If Halas doesn’t have to slide into third on that triple off of Marquard, he goes into the regular season healthy and plays well enough to earn the right-field starting job. That wouldn’t have been too difficult considering the guy who ended up starting there for New York was Sammy Vick, who hit just .248 that season. So Halas becomes a Yankee star, forsakes a career in football and never moves back to the Windy City or plays for the Bears. Taking this scenario one logical step further, if Halas has a great year in 1919, the Yankees might not have been so tempted to get a guy named Babe Ruth from Boston to replace the light-hitting Vick in right field. I know. I know. My wife always tells me I think too much. Halas was born on February 2, 1895 in where else but Chicago. He shares his birthday with this former Yankee outfielder, this current Yankee play-by-play announcer and this catcher who played for New York during WWII.